That Cat! they said… moi? Well… It wasn’t my fault, I mean… They left Fenny Compton, one of my favourite hunting grounds, way too early but soon I was up on top of the hatch checking everything was OK. When they got to Claydon Locks I went inside and kept an eye on things from on top of the sink unit. By the time got to Cropredy they seemed to coping all right without me, although there were loads of boats there for the Festival, so I went and had a lie down in a cool and quiet place while they filled up with water and put rubbish in the bins, which, by the way, were a disgrace with stuff overflowing onto the floor like they were last time we came through, I bet I could get a full time job there as a rodent control operative. We hadn’t gone very far when Mum came inside calling me, then Dad came in and looked in all my usual hidey holes, well I knew it wasn’t food time so I stayed where I was. The next thing I knew they had stopped the boat at Slat Mill bridge and went off somewhere and left me. They were gone ages, so I just went back to sleep. Eventually Dad came back and looked for pictures of me on the computer and started to make a lost cat poster. Boring! I must have done a bit of a snore because then he found me under the settee, behind his guitar case. After a bit he went and fetched Mum, apparently they thought I had got off to at Cropredy to stretch my legs and were worried, so they had walked back the 1½ miles looking for me. As if I’d ever wander off like that! Well they couldn’t tell me off could they, I hadn’t done anything wrong! 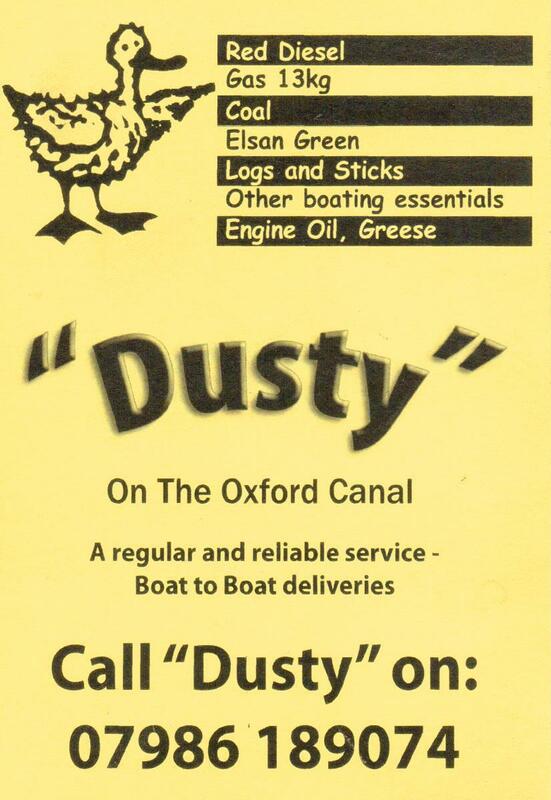 They must have been pleased to know I was OK though because later on when they moored up in Banbury town centre, they gave me some lamb from their takeaway from the Jaypur Restaurant after they had washed off the curry sauce of course. 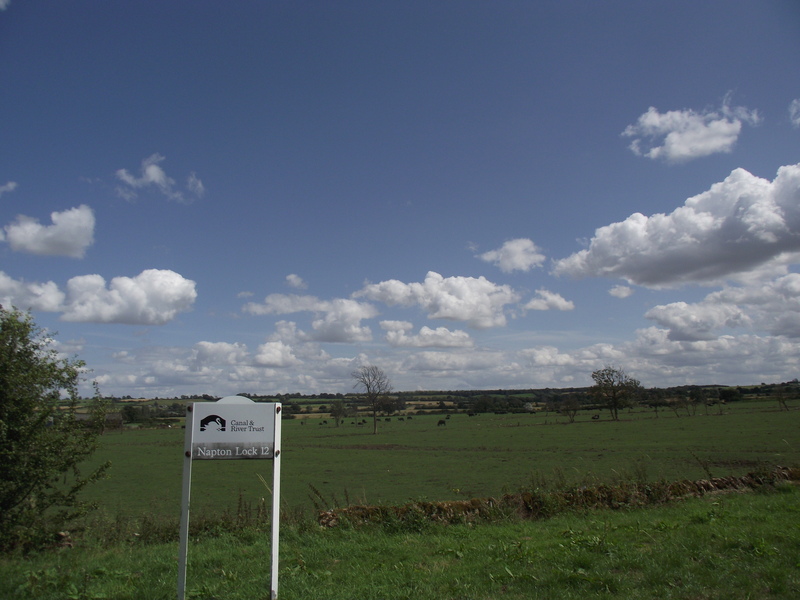 Goodness me, day 31, a month since we left Banbury! I’m not going to bore you with locks & miles because I don’t know or care very much, but I do know we’ve had fabulous weather apart from two or three wet days, seen some great scenery and met some nice people. We left Birdingbury Wharf on Sunday without so much as entering the Boat Inn (see, it was those people on Woodham who led us astray!). At Gibraltar Wharf we passed a number ‘historic’ boats including the tug Ruislip, which I really like the lines of. We ascended the three Calcutt Locks with another boat which we met along the way and made the right turn at Napton Junction. As we moored up for the last lock however, Catty decided she had had enough boating for one day and escaped into the hedge and despite attempts to bribe her back on board we had a cat-enforced early evening meal. After a two hour wait she sauntered back in at 7pm and we hurriedly went up the last lock as the water level in the pound we were in kept falling and we had no wish to remain there overnight, so it was a short hop to moor up near Priors Hardwicke where the blessed animal legged it again and didn’t come in again until eleven. Joy promised all sorts of punishment would befall the cat and that she would be confined to barracks tomorrow. 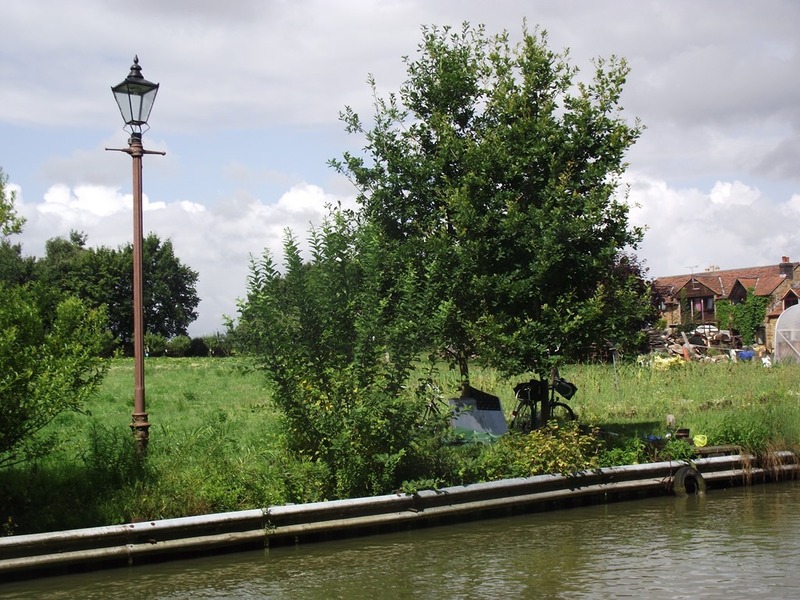 This morning we were away before nine as we hoped to bag a mooring for a couple of days at Fenny Compton and reckoned that by 11.00am most of the overnight moorers would have left. Don’t you just love it when a plan comes together? Here we are on a 14 day mooring if we so wish and guess what, Catty has been allowed out and is on ‘hedge-watching’ duty, strangely today she is staying within sight!??? After the relatively short distance travelled yesterday we had to pay for it the next day with 17 Grand Union locks, ending up at the top of the Stockton flight at Birdingbury Wharf, opposite The Boat Inn. 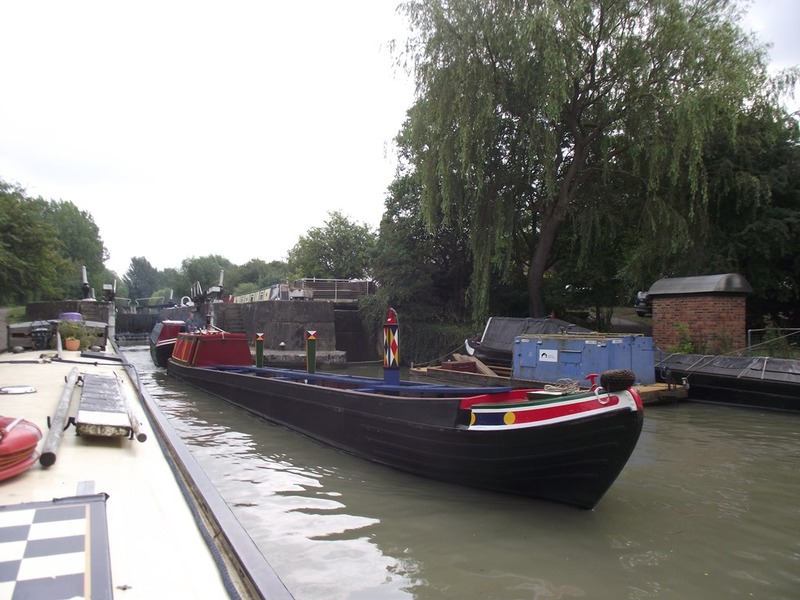 Our locking companions were so pleased with the progress that they were keen to press on to the bottom of Napton Locks, we were not so keen as rain was forecast, so we bid them farewell and Bon Voyage. They later sent a text saying they were enjoying a meal at The Folly but didn’t reveal if they got drenched! 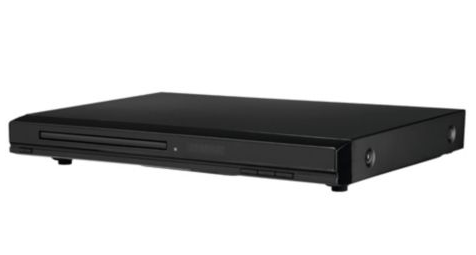 Today was a ‘rest day’ but we hopped on a bus to Rugby and bought a DVD player at Tescos as the one in our TV had died, it was very reasonable at £24 and even better when we used our £4 worth of vouchers. It is capable of ‘upscaling standard definition DVD discs to near HD quality’ which I suppose means it will give us a better picture.